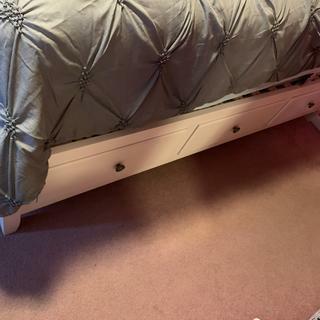 Kylie Full Platform Bed w/ 2-sd. Storage This Kylie full 2-sided storage platform bed is the kind of cool and classy furniture your child will love for years! Besides being sleek and chic with a soft cream finish, it features 6 underbed drawers that are perfect for storing extra blankets and clothes. This Kylie full 2-sided storage platform bed is the kind of cool and classy furniture your child will love for years! Besides being sleek and chic with a soft cream finish, it features 6 underbed drawers that are perfect for storing extra blankets and clothes. Love it! This looks perfect in my daughters bedroom! Got this bed for my daughter. Looks great and is very good quality! Love it! We were looking for this kind of bed and finally we go it. It is very good for my daughter. thank you. Love It! love two storage - use storage for all shoes on one side and use bed sheets on other side - more space room. Love it..
My daughter loves her new bed. The set is beautiful! We are very happy with our purchase. Great bedroom set! Love it! My daughter loves this bed and bedroom set. It is made well and is perfect for a young adult. We purchased a combination of youth and adult pieces to get what we wanted. Very happy with this purchase. Perfect size and style for our small guest room. Storage below bed eliminates need for other furniture in the small room and raises bed to a comfortable height. Where can I find assembly instructions for this bed? Is this a regular full size? Can 2 average size adults fit? BEST ANSWER: This is a standard full sized bed and can fit 2 adults. However, depending on the height of the adult, it may be too short. This bed may be on display at your local showroom to view in person. If you go to the Raymour & Flanigan website, you are able search your zip code in "Find a Store". Once you click on the product you want, then select "See In Store" under the product name. There will be a list of stores, if the collection is available. What is the height of the bed where the mattress goes? 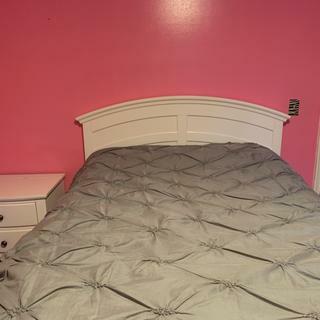 (not the headboard/footboard) looking at this bed for my toddler but concerned about height for her getting in/out. BEST ANSWER: It is 18 1/2 inches from the floor to the bottom of the mattress. Depending on the height of the mattress you are using with the bed, will determine the height to the top of the mattress.